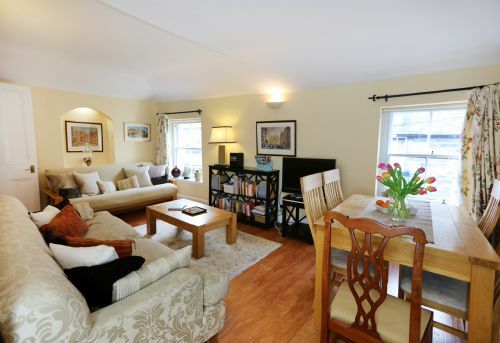 Beautiful apartment in a quiet cobbled lane five minutes' walk from Princes Street. This apartment has two bedrooms and a sofa bed in the living room, so sleeps four-to-six guests. It is in a great location for exploring Edinburgh as it is so central. There are lots of good restaurants nearby in the Stockbridge area and it's only a short walk to George Street with its trendy bars, nightclubs and restaurants. This is a wonderful flat in a spectacular location. It's just a short walk to Stockbridge, with its shops and restaurants, and it's only about a 30 minute walk to Old Town (or you can take a bus from Stockbridge). The flat has everything you need to feel at home: plenty of seating in the living and dining room, a fully equipped kitchen, and two comfortable bedrooms. It was easy to child-proof the apartment for our toddler son, and although I was worried about the exterior staircase, it is not as steep as it appears in the pictures. The flat was very clean and the flowers and treats were welcoming. We highly recommend this flat and we hope to return. A very nice place to stay, within walking distance to everything (almost). Our family of three generations (5ppl) really apprechiated the 2 bathrooms with toilet and shower in both. Books and movies for rainy days or lazy evenings added to the cozy summer cabin feel of the appartment. 1. Door to master bedroom couldn't be opened from the inside the first morning so we had to leave it open for the rest of the stay but there was a long corridor with closets before coming to the actual bed area of the room so that really wasn't a big problem. 2. They had forgotten to put out sheets and towels for the 5th member of our party (the one who slept on the futon) but there were extrta sets in the closets so that was no big problem either. If anyone in your party has trouble with stairs, this apartment isn't for you. It has steep, narrow outside stairs to get to the front door. Other than that, it is very nice. Location is just a couple of blocks from restaurants and shopping. Park is right across the street. Thought it was pricey for what you get. But it is in a good part for town, so maybe that is the difference. Our Christmas break in Edinburgh was made really special by the weather (dry) and the apartment. The apartment was presented in immaculate condition - very clean and warm. 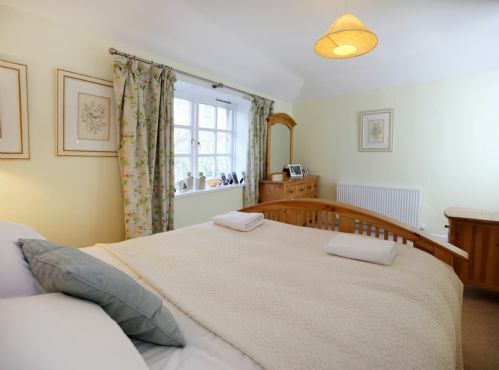 Being a mixed family group, the two bedrooms and two bathrooms set-up really was ideal and we found everything we needed for cooking and sleeping readily at hand. 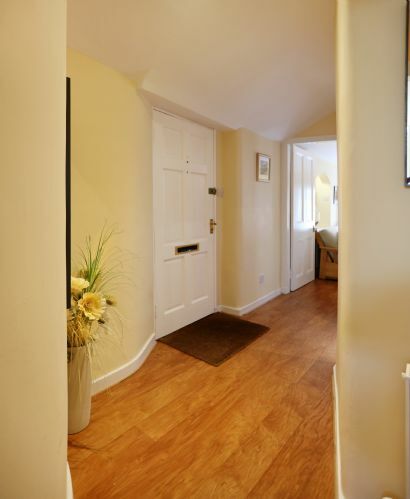 Location wise, the flat is very central (10 minutes easy walk from Princes Street) but still very quiet in the evenings. We really enjoyed our stay and would recommend this apartment. 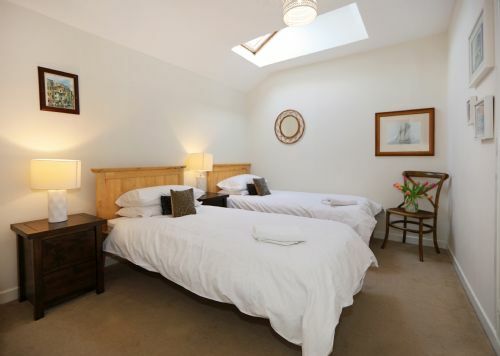 Gloucester Mews was a fantastic place to stay for the month of August while the festivals were happening. Convenient location with everything in walking distance. Busses and trains to North Berwick or Rosslyn or beyond just a few blocks away. And quiet Stockbridge is just up the street for a nice escape. Clean, bright rooms, cozy furnishings, and beautiful, efficiently organized kitchen. Collin, who is the owner of the property, is very responsive. Colin hired an external agency for managing the flat and welcoming guests. Katie was assigned to assist us during our stay. Both were very helpful and kind. 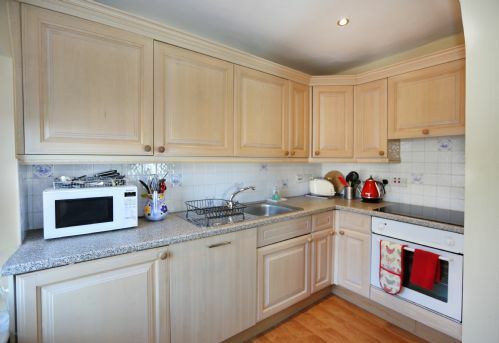 The property was very well-maintained - very clean and tidy. The area where the property is was very peaceful still, despite that it is of walking distance to tourist spots and to the town as well. For the location, cleanliness, and service that you get - it is reasonably priced. I definitely recommend staying over at Colin's! 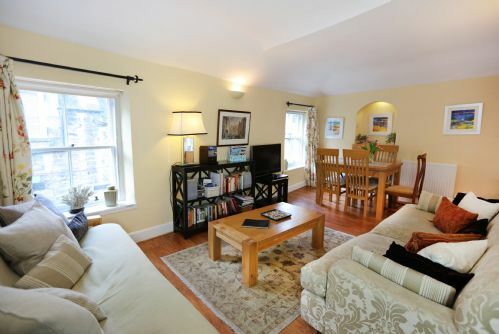 Great location close to restaurants & shops of Stockbridge. Easy access to city centre. We were based here for a family wedding with the reception at the botanics so able to walk home afterwards! We very much enjoyed our stay in Gloucester Mews. Colin was helpful and attentive leading up to our stay and Katie from Great Base was very accommodating in meeting us at the apartment early so we could drop our bags. This New Town location is perfect for pedestrian exploration of the city. You can walk anywhere in 20-25 minutes. There is so much to look at that the time flies by. There are lovely restaurants, shops and grocery stores just a short walk down the hill... not to mention a cheese monger and specialty beer store. When we needed to get across town quickly, there were plenty of Uber drivers nearby. 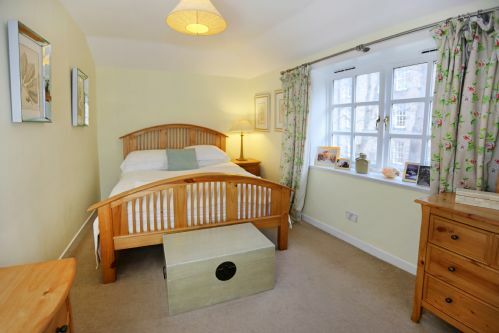 We would definitely stay in Gloucester Mews again. Perfect 10. Great tips from the lady who welcomed us. Very quiet neighborhood. Do not hesitate tout recommand it. We had a wonderful time in this spartment in Edinburgh. Katie was a great host snd the milk, coffee and cookies on arrival was very welcoming. The (4) of us were very happy with our stay at this flat. It was nicely decorated with paintings, and well maintained. The flat had just been freshly painted and only downside was paint cans taking up space in a closet and paint fumes that had to be aired out during our stay. 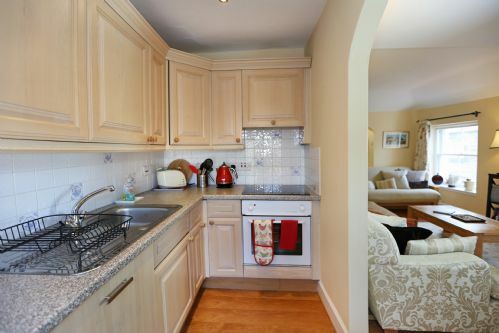 The flat is within walking distance to main Edinburgh attractions. We ate several meals in the New Town area due to the proximity of the flat to this area. Pub grub and restaurants in the New Town/Stockbridge area served tasty food. Katie was very punctual to our meeting and knowledgeable of the area. She spent time with the ladies making sure they knew how to use all household equipment. Kitchen was well equipt. I can easily recommend this flat to anyone visiting Edinburgh. We had a great time in Edinburgh. The apartment was clean, ordered and everything perfect. Surprising the furniture quality, cleanliness and good reception by Kate. Location is amazing, so close to main streets and see sights. We have been so comfortable during our staying. 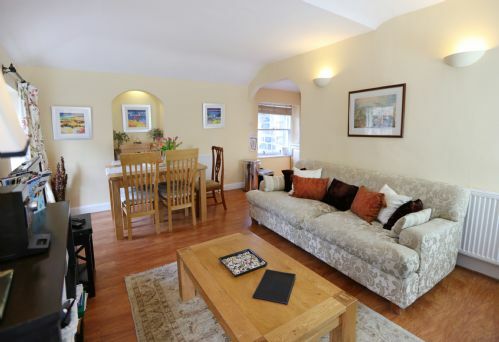 This is the second time we have chosen Gloucester Mews for our holiday in Edinburgh. Accommodated five - ourselves and our grown-up daughters comfortably (one on the fold out sofa bed which was very comfy futon). The apartment has everything we needed two bathrooms are handy for a larger group and the kitchen is compact but good enough to make a family meal. 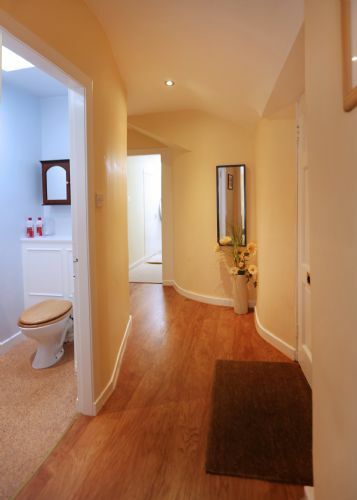 Gloucester Mews is a great location - 10 minutes walk to Princes Street and the city centre. Very pleased with the service from Greatbase who are always friendly and helpful. We would definitely stay here again - hopefully before too long! 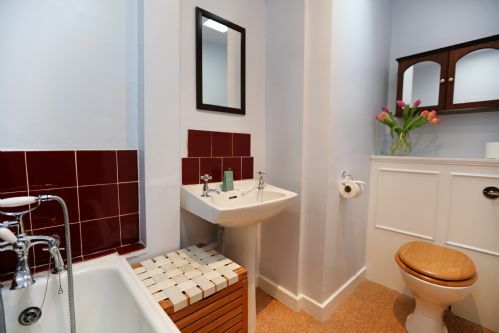 Great flat, tardis like space, twin decent sized bedrooms and bathrooms. Warm and cosy in the early Edinburgh Spring. 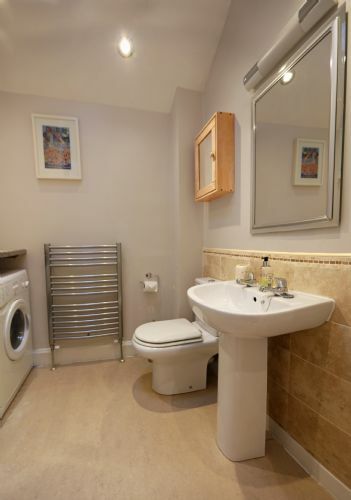 Really convenient for both Stockbridge and New Town. Don't miss the Sunday morning farmers market in Stockbrdge. 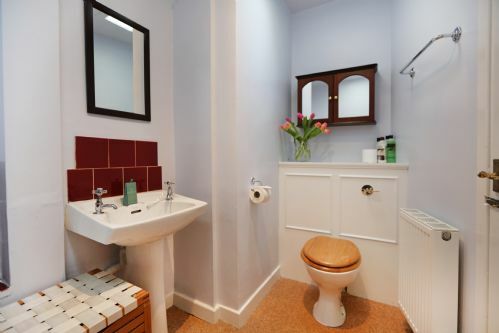 A very comfortable apartment within walking distance of most major venues at the Edinburgh Festival and main shopping areas. Our family enjoyed our stay and went to the Stockbridge market which is held on Sundays and worth a visit. I have recommended VRBO to a friend. He raved about Katie and the staff. While we liked the apt. When the power went out we called her and nothing was resolved while the neighbors and street seemed to have power restored. Stayed here for six nights in May - we really enjoyed the flat which is in a good central location 25 minutes from Waverly station and the centre of the city. We were welcomed by Katie from Great Base when we arrived who was very friendly and helpful giving us advice about local restaurants and pubs. 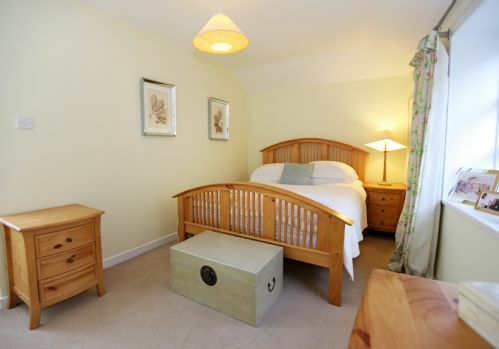 Flat was clean, bright and comfortable, all the rooms are nicely furnished and fitted and it had everything we needed. Would definitely stay here again. Location is the best. close to all of the activities that most people enjoy. I have stayed in this flat every year and would recommend it to all who visit this wonderful country. A good central location. Excellent to have tea coffee milk on arrival. A thoroughly enjoyable stay. Very quiet at night we all slept very well indeed. My fourth stay at this wonderful flat. Located in the best part of Edinburgh. Comfortable and clean. Katie Kerr is always ready to help with any thing you might need to make your stay enjoyable. I give this flat five stars!! !